Those of you who follow my blog know that every Christmas I make a very special machine embroidered card for my sister from one of my designs. Last week I made this years one for her and thought I should show the stages of its construction. Back in the summer I released my collection for this year, The Gilded Treasures collection…. I selected the angel GFE-GLT-2-14, from this collection and edited it to fit my card so it sat inside the oval aperture of the blank cards that I currently had. Open the design in your software and select each individual colour and remove the sections you do not require. Or you could deselect colours #11 and #21 as I did in the Premier 2+ Stitch Editing module, as these are very close to other elements. 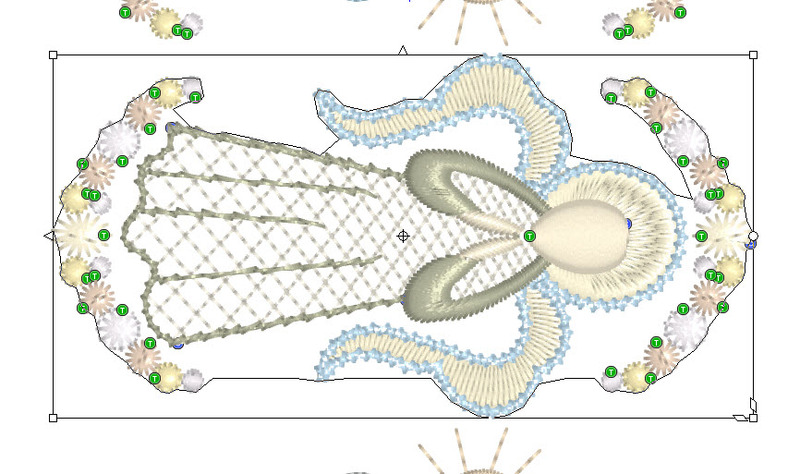 This enabled me to use my selection tools to selected the angel, so I could copy and paste it to create a new design. Rotate if necessary and save as a new design. If you have a larger aperture you could include some stars. As my cards were cream I selected cream silk dupion for my card, stitching it out on 2 layers of stitch and tear. 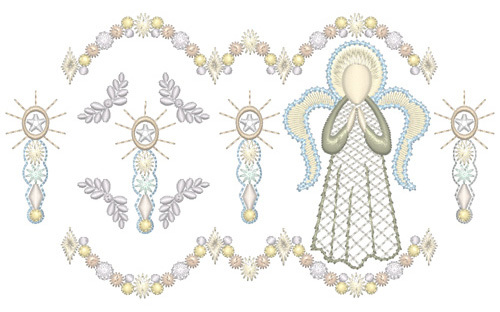 I decided to add English cotton net to the skirt of the angel. This meant that I did not stitch out the motif fill that is the third colour in the design. You will need to decide which colours you are going to use. 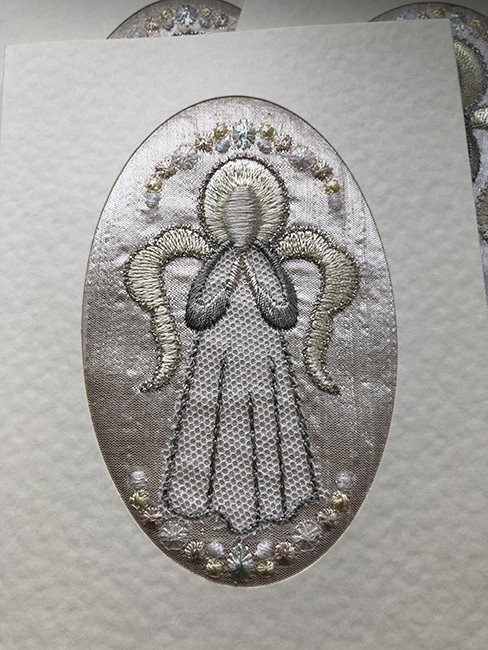 As I was embroidering on cream silk I used gold metallic thread for the outline of the wings. Some of the small motifs in this design can be stitched twice to give a fuller look. 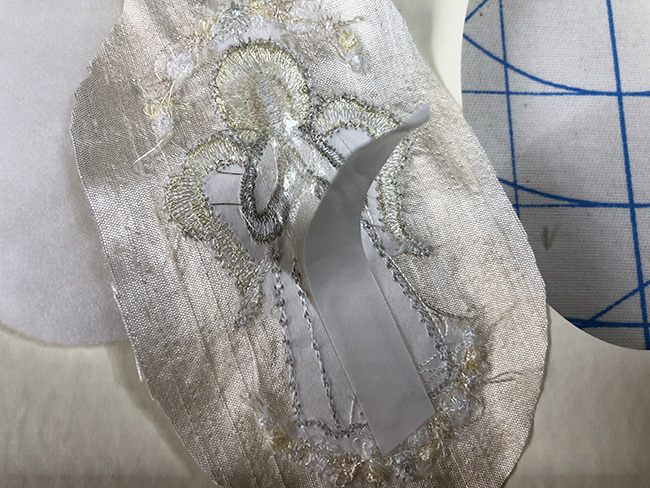 When your design is stitched out, trim any jump stitches and remove as much stabiliser as is possible before pressing the angel from the back of your work. 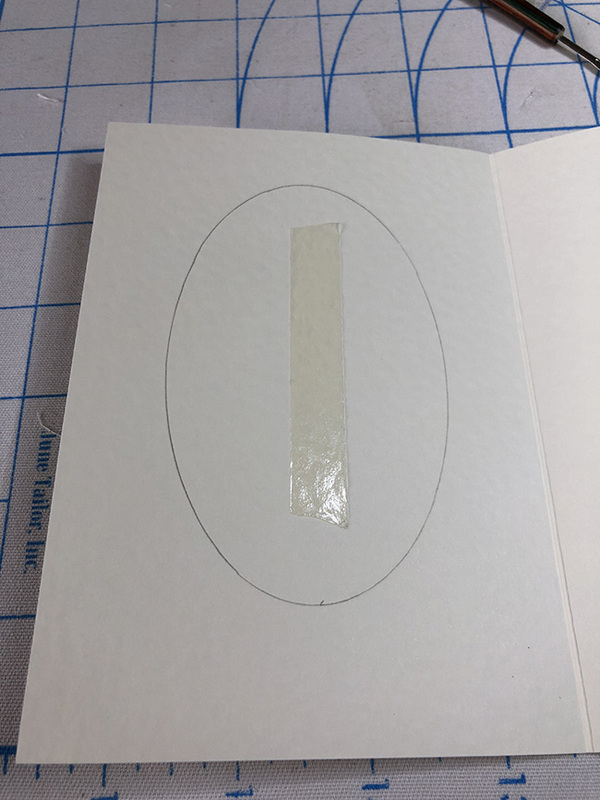 I often struggle with what seems a simple procedure of mounting an embroidery in a card, but this year I think I finally worked out how to put the card together, without getting the design out of line or upside down! 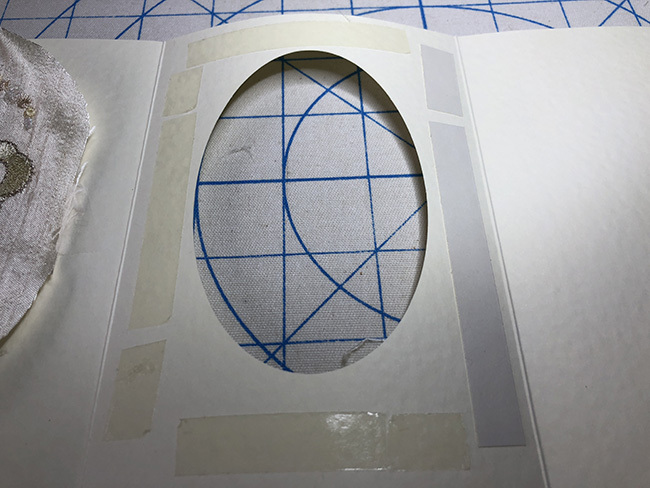 I drew a circle from the oval so I had the outline where the embroidery needed to be placed and placed some double sided sticky tape inside to hold my prepared embroidery and cushioning. I like to place batting or wadding under my embroidery making it pronounced so I cut a piece the same size as the oval and applied it within the drawn shape. If it is bigger the embroidery will not stand proud, which I think is better, so make sure that it is within your penciled shape. 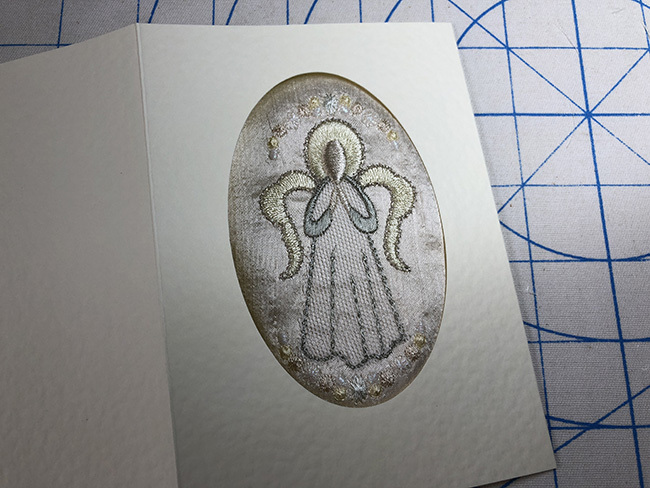 Lay your embroidered angel over the aperture of the card so you know how much excess fabric needs to be removed. Apply a length of double sided tape to the back of the angel. A few pencil marks will also show where the 12, 3, 6 and 9 o’clock fall within the oval. Check your alignment. Carefully apply the embroidery over the batting and apply right side up, making sure it is not upside down. Notice that I have secured each long side in place with sticky tape just to avoid any movement and to make sure it is all tight. 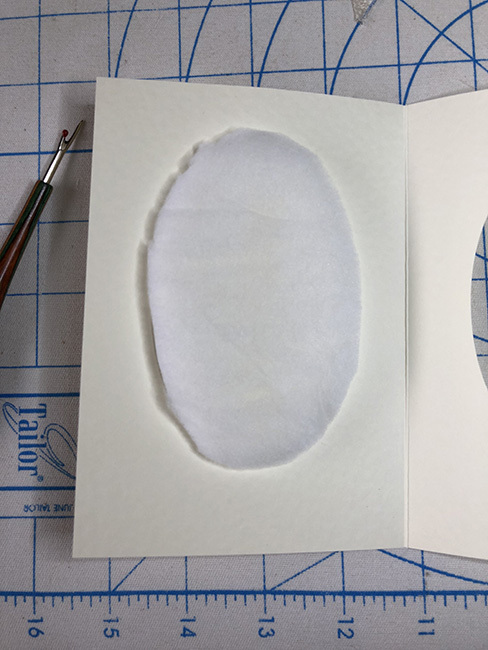 Apply double sided sticky tape on each side of the oval. Carefully fold over to secure everything in position. I choose not to add any pearls or crystals this time but you may prefer to add them. I made several of these cards and sent them to my daughters too. Have a wonderful Christmas and may I take this opportunity to thank you for following my blog over this last year. Remember that each week I select the best comment made on social media, to earn $30 worth of designs, so do make imaginative and helpful comments on my blog and you may get this weeks rewards. Best wishes for 2018. 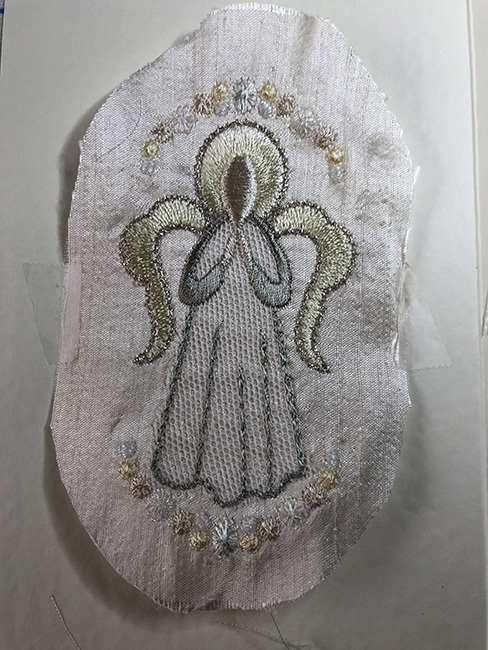 This entry was posted in Discussing machine embroidery, Embroidery projects and tagged Christmas, embroidery on silk, machine embroidery, Making embroidered cards. Bookmark the permalink. Instructions are spot on–many thanks! So many facets of this Dec. 23 blog are challenging, and I am eager to try them (as soon as I get the Christmas dinner done, I mean!). The metallic thread, the placement of the embroidered design, and the netting over the silk are all exciting ideas to me! Thank you for sharing your instructional blog. I think this would also be a great idea–except I would put it in a frame. So this would probably be for myself and not to give away. What a wonderful idea! Too pretty to be on anything that is not going to be kept. It’s exquisite! I imagine your sister and your daughters are thrilled to get your Christmas Cards each year! I wonder what they do with them after wards. I think I would frame the embroidery each year. Using the front of the card, you u already have a mat! When there are enough cards I would put borders around each and turn it into a quilt. Of course that would take many years of collecting your cards. But the wait would be worth it. I am still in awe at your imagination and creativity. You give me so much inspiration! I can not wait to get settled in our new home and I can sit in front of my new Epic and stitch out your Designs. I’m just itching to embroider! Have a very Merry Christmas and a most wonderful and Year to come! These are wonderful!! I love them and they would be beautiful framed. Merry Christmas! 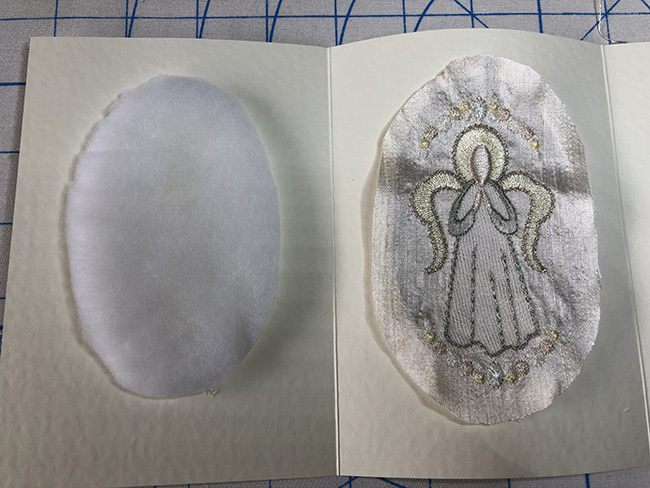 Your Christmas angel design is exquisite, and your detailed instructions from how you position and delete colors in the software for the design to how you add the embroidered design to the card is explained in easy to follow written step by step instructions. The step by step pictures that accompany the written instructions make this a project that anyone can successfully achieve. Cards are for all types of special occasions, and this type of card would make an especially lovely keepsake item for weddings, anniversaries, and baby celebrations. Thank you for sharing how to make this very special card with us. Merry Christmas and Happy New Year!! 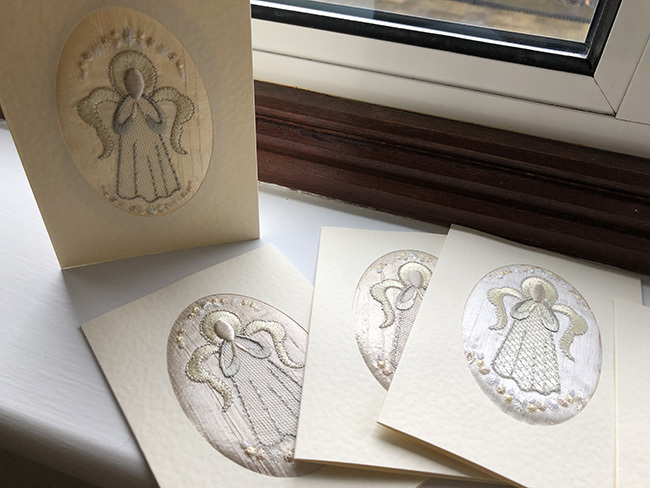 I have seen your embroidered cards the last few years and keep thinking to do one for my own sister. I seem to run out of time! Therefore, I am going to start doing my Christmas stuff in January; that way maybe I will have it all done by next December. BG Will take photos when I eventually get them done. Your cards a gorgeous! You have given me so much inspiration and good tips to carry these ideas through to produce a wonderful piece. Thank you Hazel for your wonderful creativity. Oh WOW This is my first time on your blog. You can believe I will be back. I have wanted to do embroidered cards but have never jumped in. I did not envision them to be so beautiful. I can’t wait to do one. With your step by step instructions I can now see my vision but oh so much prettier. I too will do one for Valentines day. Or when I need that extra special thank you card. Welcome to my world of machine embroidery. Click on the link under the blog, “making embroidered cards” to read previous years blogs. Make sure you open an account on my website and join my Embroidery group. Thank You so much. Happy New Year to you too.